Just 80 miles east of Silicon Valley, one of the wealthiest regions in the country, is Stockton, California — once known as America's foreclosure capital. Soon, the former bankrupt city will become the first in the country to participate in a test of Universal Basic Income, also known as UBI. Stockton will give 100 residents $500 a month for 18 months, no strings attached. The nontraditional system for distributing wealth guarantees that citizens receive a regular sum of money. The goal is to create an income floor no one will fall beneath. The concept of Universal Basic Income has gained traction and support from some Silicon Valley leaders, including Elon Musk, Richard Branson and Mark Zuckerberg. It is seen as a way to possibly reduce poverty and safeguard against the job disruption that comes from automation. "We should explore ideas like universal basic income to make sure that everyone has a cushion to try new ideas," Zuckerberg said at a Harvard commencement address in May 2017. The Stockton project has its roots in Silicon Valley, too. Its financial backers include Facebook cofounder Chris Hughes' organization, the Economic Security Project — a fund to support research and cultural engagement around Universal Basic Income. It contributed $1 million to the Stockton initiative. Related: Mark Zuckerberg supports universal basic income. What is it? In an interview with CNNMoney earlier this year, Hughes said being part of the country's top 1% helped him realize the great inequities in the economy. "It is such a fundamental idea behind America that if you work hard, you can get ahead — and you certainly don't live in poverty. But that isn't true today, and it hasn't been true in the country for decades," Hughes said. "I believe that unless we make significant changes today, the income inequality in our country will continue to grow and call into question the very nature of our social contract." With a population of more than 300,000, with one in four people living in poverty, Stockton was considered a great testing ground for Universal Basic Income. 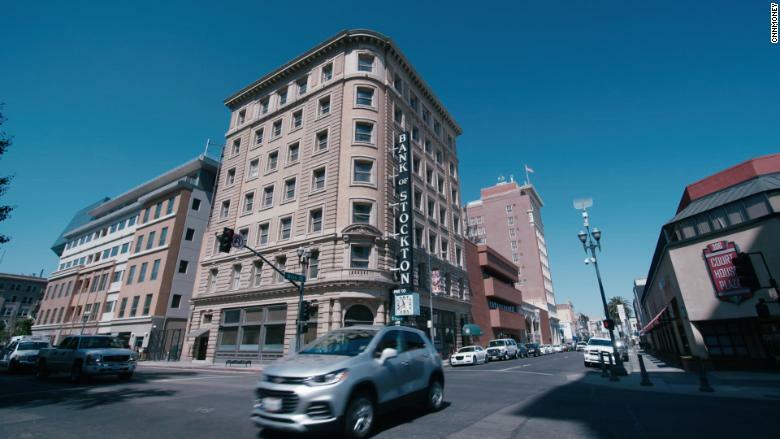 "Stockton is a city that looks a lot like the rest of America," said Natalie Foster, co-founder and co-chair of the Economic Security Project. Stockton has a median household income of $49,271, compared to $57,617 nationally, according to U.S. Census Bureau estimates. It's also diverse: More than 70% of the city's population identify as minorities. 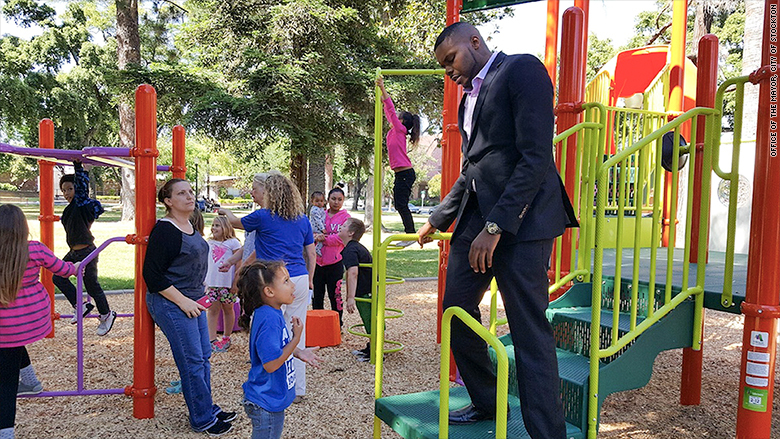 "We have a bunch of folks starting off life already behind, born into communities that don't have a lot of opportunity," said Stockton Mayor Michael Tubbs. "My mom always used to say, 'You have to get out of Stockton.' ... 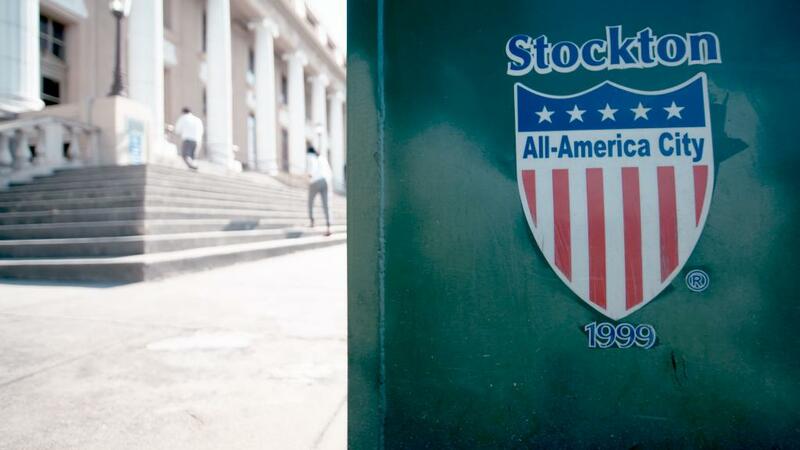 But I want Stockton to be [a place people] want to live in." His interest in Universal Basic Income also stems from the "looming threat of automation and displacement." Tubbs believes the companies building these technologies, "have a responsibility to make sure people aren't adversely impacted and also make their communities better places." This is one way to help. Stockton residents are clamoring to get one of the 100 UBI spots. "My email inbox is inundated daily with residents from the community wanting to know, 'What's the sign-up process? Has it already started? Am I already too late? What do I have to do?'" said Lori Ospina, director of the Stockton Economic Empowerment Demonstration, which is running the project. The project, expected to launch in 2019, hopes to use data to address the policy questions about UBI. For example, does a guarantee of a basic income affect school attendance and health, or cause people to quit their jobs or start new businesses? The project is also interested at looking at how the funds impact female empowerment and if it can help pull people out of poverty. The Stockton experiment is not the first demonstration of universal basic income. Similar programs have already been conducted by various organizations or governments in Finland, Italy, Uganda, Cambodia and India. In Finland, a monthly stipend of 560 euros was given to 2,000 unemployed people between the ages of 25 and 58. In Cambodia, $5 a month went to pregnant women and children. A 12-year pilot program sponsored by the nonprofit GiveDirectly.org is underway in Kenya, while a similar program sponsored by the Canadian government is undergoing testing in Ontario. Another pilot, backed by startup accelerator Y Combinator, will give 1,000 people in Oakland, California, $1,000 a month for up to 5 years. "I've watched the tech [community] become very interested in Universal Basic Income for the past several years. I think it stems from one part guilt and one part optimism," Foster said. "These are folks who believe in the moonshot, believe in the big ideas, and that nothing is too big." Foster suggested that other cash transfer programs show how UBI could work more broadly. For example, for the past 40 years, all Alaska residents, including children, have received a varying annual cash payment from oil royalties. "They use it to save for education, to get them through seasonal changes in their work, or to pay for heating during the winter when that gets much more expensive," Foster said. According to Allison Fahey, associate director of MIT's Poverty Action Lab, it's too soon to tell if UBI will help reduce poverty. But she believes the experience in Stockton and other cities will provide answers. "It has really exciting potential, and this is why it is important to look into," Fahey said. "It's a very radical way of delivering aid. There is an elegance and beauty to how simple it is."